One day, on my way to work, I found a prayer card on the grass. I picked it up and brought it into work, thinking that somebody had lost it. Nobody claimed it, so I kept it and I say the prayer nearly every day. That was over seven years ago and I know in my heart that it was no accident that I found this prayer card. The power of this prayer has changed my life! 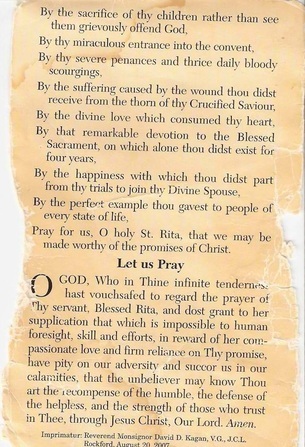 The purpose of this site is to share with you reflections, testimonials, the life of St. Rita and the miracles that can happen through prayer. This site is not affiliated with any particular religion, it is not specifically Catholic nor any religion at all. This site is for all who are facing things that seem impossible; may St. Rita give you the strength and the courage and comfort for you to face the difficulties in your life. This picture is a scan of the actual card that I found on the grass. The photos below are the inside pages. You will notice that there is a prayer request that is scratched out. I have tried on many occasions to decipher this person's prayer, but I have been unable to do so. Every now and then I remember to pray that this person who lost this card on the grass may have been granted his/her request as well. I often wonder about the person and what they may have been going through that caused him/her to seek out St. Rita of Cascia. Perhaps you can decipher the request, maybe not, but please do pray for this person as well.